This commission walked in the door at the tail end of a huge glass tile project that was just wrapping up. I was looking forward to a break but this was a request from a friend... I could not refuse. As it turns out, this was like the fresh lemon sorbet after a large satisfying 5 course meal, light and refreshing. Dusting off my hammer & hardie, I set to work. Working on stone again, with all its color, texture and personality was such a wonderful cleansing of the palette. While doing the initial research, I conjured up yet another piece I would like to create with this interesting animal. One thing always leads to the next. 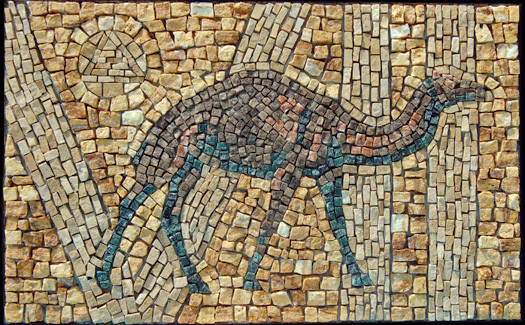 Camel VII is now the latest in a collection of this Dromedary for its owner. They are of different materials and poses, this one, the first to be set in stone. Many more will be able to stand on his shoulders.